Maryna is currently a Postdoctoral Research Associate in the lab of Jonathan Henry in the Department of Cell and Developmental Biology at the University of Illinois, Urbana-Champaign. She holds a PhD in Biology, Neotropical Environment Option, from the Department of Biology, McGill University, Montréal, Canada and the Smithsonian Tropical Research Institute, Panama. She was Supervised by Ehab Abouheif (McGill) and Rachel Collin (STRI). Presenting my thesis work at the 2015 Quebec Centre for Biodiversity Science Symposium. Photo by Stéphanie Sabbagh. How do you get from a single cell to a complex multicellular organism? Why do marine invertebrates have so many ways of doing just that? What role does the environment play in development? How does development change over evolutionary time? How do transitions between different types of development happen? What do invertebrate larvae do while they are swimming around in the ocean? How do organisms use so many of the same developmental “tools” to make so many different forms? An undergraduate field course at Bamfield Marine Sciences Centre changed my life. Learning about invertebrate biology showed me that what I really wanted to do with my life was to play in a tide pool. That led me to do my M.Sc. at the University of Victoria, where I fell in love with marine invertebrate larvae. After a brief foray into teaching English to students of all ages in both Japan and Québec, I realized that I missed science. I did my PhD as part of the Neotropical Environment Option, giving me the opportunity to work with amazing people at both McGill University and the Smithsonian Tropical Research Institute. I studied eco-evo-devo with Ehab Abouheif, and tackled the amazing development of the calyptraeid gastropods with Rachel Collin. I never figured out that it was smarter to go to Panama during winters in Montreal. My next adventure will be to unlock the secrets of Crepidula with Jon Henry at the University of Illinois at Urbana-Champaign. 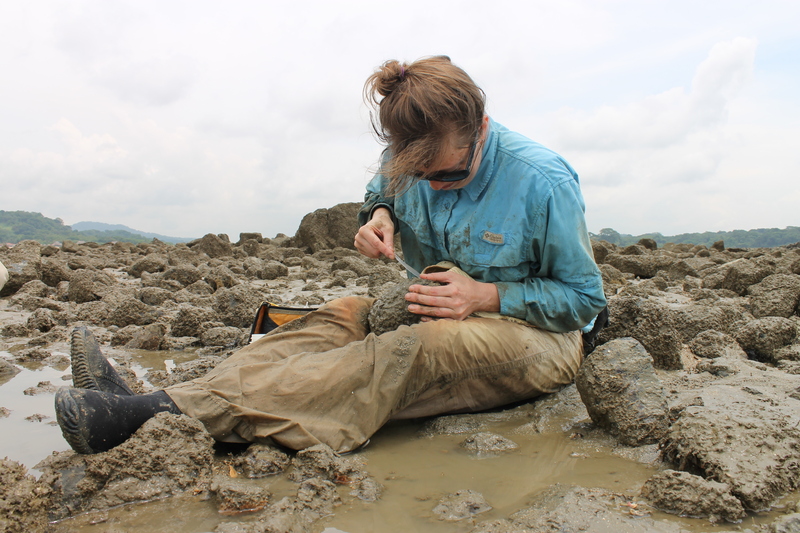 Collecting calyptraeid gastropods in the intertidal in Panama.